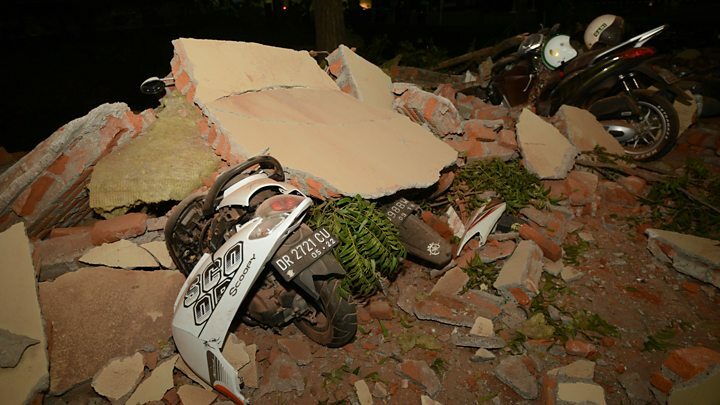 At least 82 people are now known to have died after a powerful earthquake hit the Indonesian island of Lombok on Sunday, emergency officials say. A tsunami warning was issued in its aftermath but it was lifted several hours later. A spokesman for Indonesia’s disaster mitigation agency told the AFP news agency that many buildings had been affected in Lombok’s main city of Mataram, most of them built with weak construction materials. A worker in Bali’s capital city Denpasar described the scene to the BBC. Airports on both islands are both operating normally despite some minor damage – at Bali’s Denpasar airport some ceiling panels were shaken loose by the tremors.